Published: Aug. 12, 2012 at 08:30 p.m. Updated: Aug. 13, 2012 at 04:36 p.m.
One day after his arrest on a domestic violence charge, the Miami Dolphins have said goodbye to Chad Johnson. That according to NFL Network contributor and Fox Sports insider Jay Glazer, who first reported Sunday the team cut the veteran wide receiver and cleaned out his locker at Dolphins training camp. 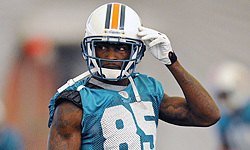 The Dolphins made the move official a short time later, announcing Johnson's contract has been terminated. It caps a sudden turn of events for Johnson, who two days ago was atop the Dolphins' depth chart and perceived to be on the comeback trail. His Saturday arrest for allegedly head-butting his wife during an argument changed everything. It's premature to speculate Johnson's career is over at 34, but a potential legal case coupled with the deep stain to his character could make catching on with another team very difficult.